Integers is the set of numbers containing whole numbers and their opposites. In a number line, positive integers are located at the right side of zero (0) while the negative integers are located at the left side of zero (0). A negative integer is an integer that is less than zero. In the number line, these integers are located at the left side of zero (0). Negative integers are the opposite of positive integers. For example, -2 is the opposite of 2. 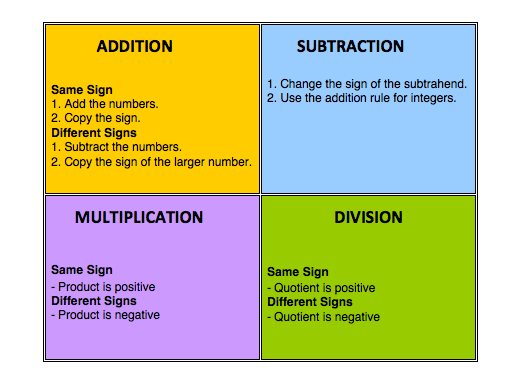 Even though both integers have the same number, they have different signs. In real-life application, negative integers are used as an opposite in relation to a certain reference. Taking 4 steps forward can be considered as +4 (positive 4). This means it is 4 steps ahead of the starting point. 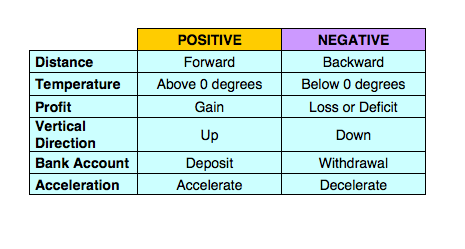 Taking 4 steps backward can be considered as -4 (negative 4). This means it is 4 steps behind the starting point. 5 degrees above 0 degree Celsius is considered as +5°C. This means it is 5°C hotter than 0°C. 5 degrees below 0 degree Celsius is considered as -5°C. This means it is 5°C colder than 0°C. A $8 profit means it is a gain of $8. A -$8 profit means it is a loss of $8.